Another new comedy on Sky began last night (Sept 20th 2011), this time on channel Sky Atlantic – it goes by the name of This Is Jinsy. The series kicked off with a double bill of episodes, here are my thoughts (with no spoilers). First off a bit of background info. The cast includes appearances by big names such as David Tennant, Harry Hill, Jennifer Saunders, Catherine Tate, Simon Callow and Peter Serafinowicz. It is directed by Matt Lipsey (Psychoville, Little Britain, Saxondale). The series follows the residents of Jinsy. And in particular, Arbiter Maven and Operative Sporall who keep a close eye on everyone from the Great Tower in the parish of Veen. Only a couple of minutes in and you know this is one wacky show! Obvious comparisons will be made with the Mighty Boosh and The League of Gentlemen as the style is much the same. If you loved/hated those shows, odds are your feelings will be similar towards this. I enjoyed both the first and second episodes. No breaking in slowly required here, straight up and running with the freakiness. Even after the first 10 minutes I loved the quirkiness. I also love the way it is produced, it is a visual treat to watch with the strong colours, outfits and effects. I am a fan of oddball comedy, it’s unpredictable, stupid but yet when it works is brilliant. And in these first two episodes they’ve achieved that. The Mighty Boosh has always had a very cult following. I think this will go much the same way, whether it can replicate such success we will have to see. Overall I thought it was great. Original, funky, funny, unpredictable and well produced this show can certainly go a long way. However, on an individual basis, if you don’t like this sort of comedy – perhaps one to steer clear of. 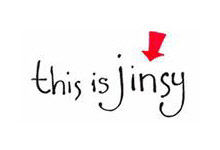 What did you think to This Is Jinsy? Share your thoughts below. But I love boosh! Thanks for getting back to me Chris and regards to your dad. Hope you continue to enjoy jinsy. Hopefully there’ll be more boosh soon. No you’re certainly not, my father referred to it as ‘horrendous television’ and literally couldn’t find enough descriptive words to say how terrible he thought it was! haha. Because of the style it is it will always be a marmite show, love it or hate it, much like the Boosh is. I think it’s fantastic, but can also see why some people would find it trash. I just don’t get it. Is it only me that thinks this is the worst thing that’s ever been shown on TV?